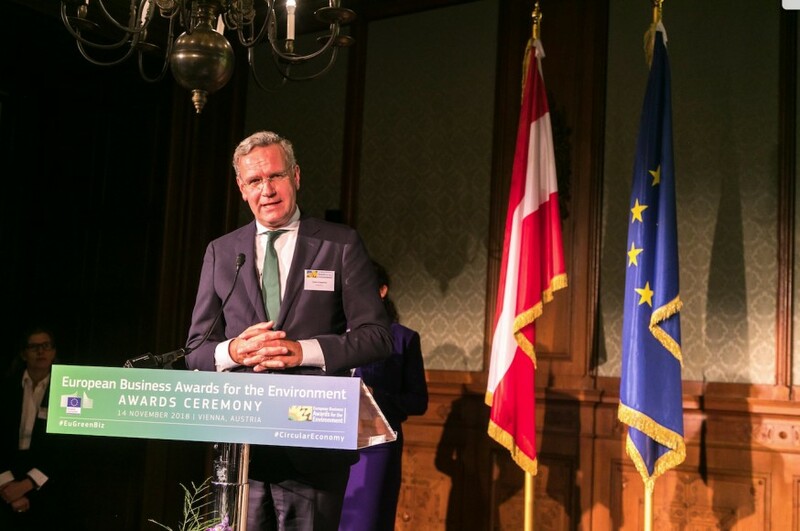 Organic produce specialist Eosta has won the European Business Awards for the Environment (EBAE), a title bestowed upon the company during a ceremony in Vienna this month. The prestigious prize is awarded by the European Commission, having developed the competition in order to highlight companies that successfully combine innovation, competition, and sustainability. The pioneering work that Eosta has conducted in the field of True Cost Accounting was part of the reason that the Dutch company won the award, as was made clear by Gilles Gantelet, director of general environment at the European Commission. The EBAE covers six different categories, with Eosta winning in the category ‘Developing country cooperation’. The Netherlands-based company works with thousands of organic growers in many countries covering five continents. Through its transparency system, Nature & More, and its True Cost of Food campaign, Eosta offers insight into the sustainable efforts of its growers, aiming to empower consumers to make conscious choices as well as obtaining a better price for growers. One of the reasons that Eosta was awarded the prize is because of the work it has been doing in the field of True Cost Accounting and supply chain transparency. True Cost Accounting is a new form of accounting in which hidden environmental and social costs are included in profit and loss calculations. In 2016 Eosta started the True Cost of Food campaign and published data about the hidden costs of farming, comparing the organic with the non-organic alternative. The campaign was brought to the shop shelves and had a huge impact in the supply chain and on policymakers. Gantelet, who explained the jury verdict, said: "Over the past years, Eosta has shown true leadership and has taken True Cost Accounting from theory to practice. Today, it is almost impossible to talk about sustainability without True Cost Accounting." In his acceptance speech, Eosta CEO Volkert Engelsman spoke about how the market is changing rapidly. "Banks, investment companies, and investors are already looking at the impact that companies have on social and natural capital in order to analyse risks," he explained. "As a consequence, the future does not look bright for businesses that are not taking sustainability seriously." In 2018 Eosta has won three sustainability awards thanks to the True Cost of Food campaign and the plastic-saving no-packaging Natural Branding introduction. Furthermore, Volkert Engelsman was elected Most Sustainable Dutch individual in 2017. Being awarded the King William I Prize for Sustainable Entrepreneurship led to the EBAE nomination. The award ceremony took place during the Growth in Transition Congress in Austria on 14 November 2018. The jury selected 22 finalists from a total of 161 submissions, coming from 19 countries. Eosta was the only fresh-produce company amongst the nominees.